Crow Shooting Supply becomes the first wholesale partner added by Henry Repeating Arms in 15 years. 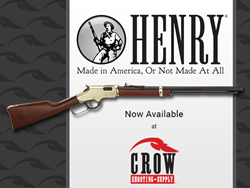 Crow now carries Henry's full-line of American-made rifles and shotguns. Crow Shooting Supply, The First Choice for Wholesale Firearms, Ammunition and Reloading Supplies, is proud to announce it is now a full-line distributor of Henry Repeating Arms’ classic lineup of American-made rifles and shotguns. To celebrate, Crow Shooting Supply is offering special introductory pricing on all Henry models through August 31, 2017. Henry Repeating Arms is one of the grandest and most respected manufacturers worldwide for lever action rifles and shotguns. Crow Shooting Supply, named the first new Henry distributor in 15 years, carries more than 100 Henry models that are in-stock and ready to ship. To take advantage of Crow’s limited-time, special introductory pricing on Henry firearms or to learn more about partnering with Crow Shooting Supply, call 800-264-2493 or visit http://www.crowshootingsupply.com today. Henry Repeating Arms is one of the country’s leading rifle manufacturers and top ten firearm manufacturers. Their company motto is ‘Made In America Or Not Made At All’ and their products come with an unlimited lifetime guarantee. Henry Repeating Arms was awarded the Stevie American Business Award for Customer Service. The company’s manufacturing facilities are in Bayonne, NJ and Rice Lake, WI with approximately 450 employees. Crow Shooting Supply is a family-owned, national wholesale distributor of firearms, ammunition reloading components and shooting accessories. Proudly serving retail gun shops, major sporting goods stores, gun clubs, shooting ranges and government agencies for over 30 years, Crow is a full-line supplier of nearly 120 of the world’s premier shooting industry manufacturers. With warehouses in Iowa, North Carolina and Nevada, Crow offers timely, efficient shipping anywhere in the U.S. To partner with, or learn more about Crow Shooting Supply, call 800-264-2493 or visit http://www.crowshootingsupply.com.